The Romantic period witnessed four revolutions (American, French, Haitian, Industrial) as well as social upheaval, global commerce, abolitionist movements, and colonial expansion. This introductory course explores the literature of these turbulent decades. We will consider how Romantic authors imagined their changing world, debated Britain’s place within it, and ultimately shaped concepts – celebrity, individualism, science fiction, democracy, to name just a few – still at work in our own time. 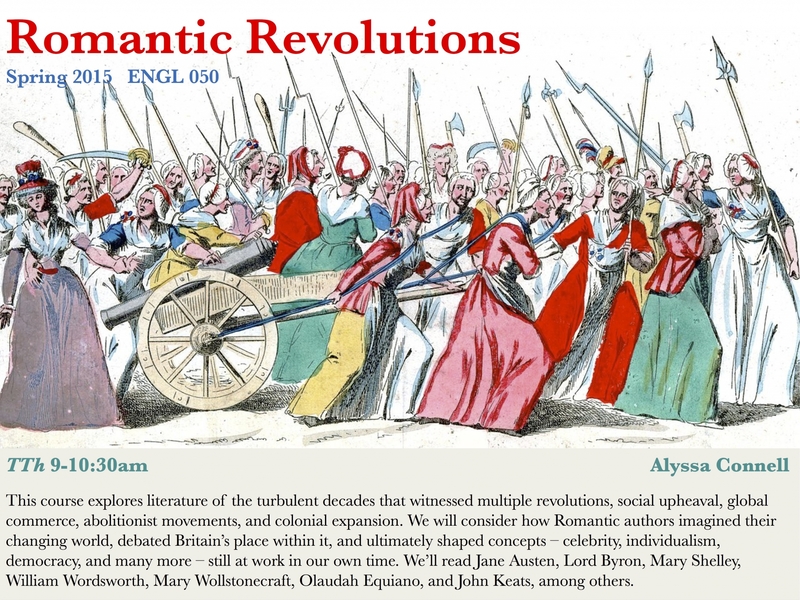 In addition to thinking about major literary forms and aesthetic innovations of the period, we will examine the cultural events that shaped Romantic fiction, poetry, and drama. We’ll read Jane Austen, Lord Byron, Mary Shelley, William Wordsworth, Mary Wollstonecraft, Olaudah Equiano, and John Keats, among others. Assignments will include a presentation, a paper, and a final exam.